Menominee is a selection from a cross of Richter’s Jubel and seedling 44537. Richter’s Jubel is a scab-resistant European variety having little commercial promise in this country. Seedling 44537 was a russet mutation from the cross Chippewa × Katahdin; it was low-yielding but scab-resistant. Menominee is highly resistant to scab and moderately resistant to late blight. 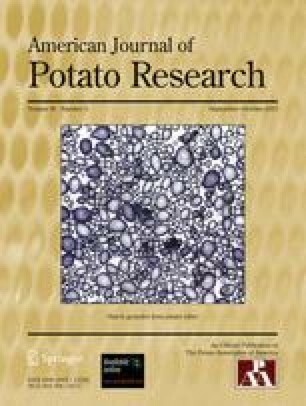 Tests in Michigan show that if this variety, which is late maturing, is planted early it will produce relatively high yields of potatoes of good cooking quality. Its tubers do not cling to the vines when harvested before the plants are mature as do the tubers of Russet Rural and Sebago. Menominee has yielded consistently, more bushels of U. S. No. 1 tubers per acre at Lake City and Rogers City, Michigan, than Chippewa, Russet Rural, or Sebago. It is scab-resistant in Maine where it was first produced and tested but has not been promising at Aroostook Farm, Maine, except for its scab resistance. It is intermediate there in yield and relatively low in dry-matter content. Menominee is being distributed to growers in the late potatogrowing sections where, because of common scab, U. S. No. 1 potatoes of the old commercial varieties can no longer be produced. It is hoped that a better scab-resistant variety will be available in the near future. About 2,800 bushels of seed of Menominee were produced in 1943. Most of this will be grown for increase in 1944.